I'm casually following the World Editors Forum and World Newspaper Congress on Twitter. @Newspaperworld,@journalismnews and @journalism_live are all providing great coverage. It is a very interesting conference with tons of good insight. But being a conference for the "old media", you also see quite a lot of old world thinking-ideas and concepts by people who have forgotten why they are in business. One example was a session about "what content print newspapers should focus on to survive." Back in the 1600, when newspapers were first invented, the editors didn't say: "I want to do something with paper." Their business was to create news and at the time paper was just the best tool for the job. You do not say, "how do keep using this tool." You say, "how do we keep making news!" Print is a tool. News is the business model. You are not in the business of keeping print alive. A session like that is a scapegoat for people who don't want to change. Another thing that caught my attention was when people said, "we need to integrate digital with print." It sounds very efficient, and the right thing to do, but take a look at the picture below. 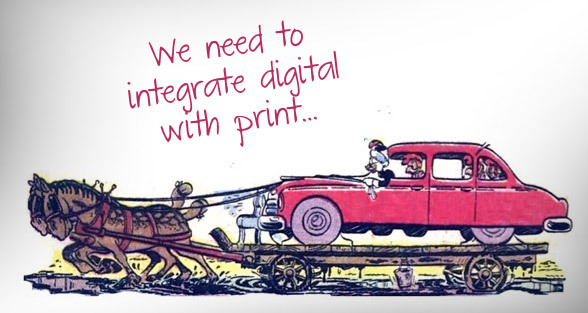 That is what integrating digital with print means. You are taking a car and integrating it with a horse carriage. It is not really what you want to do. If you have a print-first mindset, then yes, you do need to add digital to it. But it is a one way street. Print leads to digital; digital does not lead to print. What you should do is to separate your tools from your business. You are in business the of making valuable content that people want to read (and pay for), you should not restrict that to a format. You should not even think of it as a format. You product is not print, it's not digital, it's not an iPad app and it's not a feed. Your product is your content.